If you control no monsters, you can Special Summon this card from your hand in face-up Attack Position. If you Tribute this card to Tribute Summon an "Elemental Hero", "Destiny Hero" or "Evil Hero" mo..
Once per turn, you can equip this card to a Warrior-Type monster you control, OR unequip it to Special summon this card in face-up Attack Position. While equipped to a monster by this effect, when tha..
1 Fiend-Type Monster + 1 Rock-Type Monster. This monster cannot be Special Summoned except with "Dark Fusion". 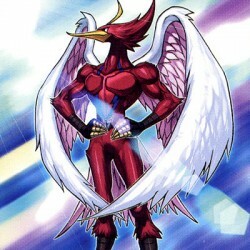 The original ATK of this card is equal to the combined ATK of the Fusion Material Monster..
"Elemental Hero Avian" + "Elemental Hero Wildheart". This monster cannot be Special Summoned except with "Dark Fusion". If this card attacks, your opponent cannot activate any Spell or Trap Cards unti..
"Elemental Hero CLayman" + "Elemental Hero Burstinatrix". This monster cannot be Special Summoned except with "Dark Fusion". During your Standby Phase, if this card is in face-up Defence Position, inf..
"Evil Hero Malicious Edge" + 1 Level 6 or higher Fiend-Type monster. This monster cannot be Special Summoned except with "Dark Fusion". During your opponent's Battle Phase, all monsters they control a..
Once per turn, during your Main Phase, you can Special Summon 1 "Elemental Hero" monster from your Graveyard that was destroyed by battle. (Only this card's controller can use this effect.).. Activate only when face-up "Neos" Fusion Monster you control is destroyed. Special Summon 1 "Elemental Hero Neos" from your Deck in Attack Position. It gains 1000 ATK and is destroyed during the End .. Send, from your hand or your side of the field to the Graveyard, Fusion Material Monsters that are listed on a Fiend-Type Fusion Monster Card, and Special Summon that Fusion Monster from your Fusion D.. Remove from play, from your hand or your Graveyard, the Fusion Material Monsters listed on a Fusion Monster Card that can only be Special Summoned with "Dark Fusion", and Special Summon that monster f.. Discard 1 "Polymerization" to the Graveyard. Send 1 Fusion Monster from your Fusion Deck to your Graveyard and Special Summon 1 monster from your hand that is listed as a Fusion Material Monster on th..
Activate only when your opponent's monster declares an attack targeting a face-up "Elemental Hero" monster you control. Switch control of the opponent's attacking monster with the trageted monster you..
Activate only when an "Elemental Hero" monster you control is destroyed by battle. Your opponnet selects 1 random card from your hand. If that card is an "Elemental Hero" monster, destroy 1 monster yo..